It took me four years of thoughts. I had been feeling its aroma for long time, but I couldn’t express my thoughts in real trades. I knew that something strange was going on, in this world of lurkers and losers, in this club of 95% of people doing the same thing while expecting different outcomes. Everytime I had to take a decision between convexity and concavity, I made a mistake. I fell because I tried to bridle in a convex curvature the waves of the unknown. It took me long time to retrieve my side-thinking approach to get rid of the thousands of pages I have been reading on technical analysis and options trading. It was not easy to understand the words of incerto, also it was not easy to come to my trading method: being cradled by the waves of the market. You know, there isn’t a true decision to be taken. The methodology that underlies my trading style is a self fulfilling prophecy. You won’t sell the gamma, as you won’t sell the vega, you’ll buy them. This said, I’ll show you the rules of my method. And, to be more focused, I’ll synthesize them clearly, so that you could easily apply them when you feel you have worked enough on your mind to overcome the fear of loss. First: Do never trade stocks, currencies, commodities, bonds, but just equity indexes. Trade them with futures or etfs, but indexes. You know indexes can not reach zero and they do not suffer from contango. Do not go short. Long trades only. Second: Change the way you see your inventory. Each trade should be considered separate from the others. Use the valuation method known as LIFO (Last In, First Out). The LIFO system is used by Generally Accepted Accounting Principles (GAAP) to evaluate the inventory. It can be shown that when the market prices rise, the LIFO system reduces the overall amount as it creates a hidden positive reserve, while, when prices fall, it increases the overall amount of the inventory, freeing up some gain. I am not telling you to make a step forward. I am telling you to jump. I am telling you that the average price that your broker accounts for your futures/etfs inventory is just an “illusion”. It’s just a way to evaluate your inventory. Don’t believe them. Challenge the obvious and you’ll have the answers. Ok let’s do an example: let’s assume for the sake that you bought XLF at 17, then 16, then 15, 14, 13 and then 12. This is adding to losers, it’s averaging down. Yeah, I know. But hold on. Your average cost is 14.5. People think that if market does not touch 14.5 anymore, and they sell one unit at 13, they get a loss. As a matter of fact, the broker accounts for a loss, more with the futures, where the accounting method is FIFO. But you challenge your broker as you account for LIFO, and as the last in was 12, when it comes out at 13 you get 1 gain. Then you divide 1 by 5 and you’ll see that your average cost is 14.8. If the price goes down to 12, you’ll buy it again. Doing so, you can lower your average cost even if the market never touches 14.5 anymore. Thanks to Arseniolupin. The idea of this LIFO method application belongs to him. Third: you may sell covered calls, but you can also double the sale at ATM (CBOE calls it stock repair strategy). Let’s assume you bought XLF at 18, now the price is at 17. You can sell two ATM calls at 17 and buy a call 16 for a credit. This way you are lowering you cost basis without adding money, but just time. Fourth: you may use Taleb backspread strategies to hunt the black swan. As we are building our long position, we will cover our portfolio with deep otm puts or highly correlated underlying instruments to build those backspreads. Depending on volatility, you will either build backspreads or, as I show in my real time trading, affordable cheap futures with huge amounts of puts. Please keep in mind that I do not have stop loss, I have enough trading capital to back even 10 futures to zero. So get the proper mindset. Fifth: don’t trust options’ payoffs. 70% of things we know comes from the eyes. What we sense, perceive, detect, see, is the reality. But the reality does not exist, for us, if we do not perceive it. Somebody said “Esse est percipi”. Unfortunately, when we depict the payoffs we draw the atnow curve. Every trader, ama and/or pro, do that, each single option trading platform has an at now. The atnow curve shows the potential gain or loss according to the variation of the underlying price. But this is true if volatility is constant. And we know that volatility is not constant, but it is volatile itself. So as delta, that we need for hedging: this derivative is a measure based on instants. Nothing more. Whilst our curve is continuous. That’s why Taleb tells us about dynamic hedging. 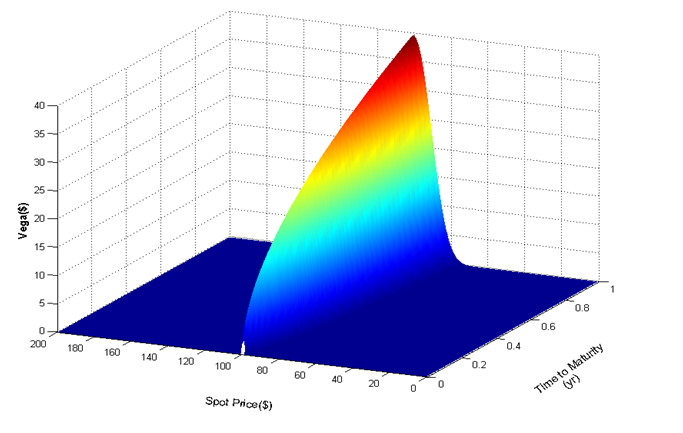 The x-axis, for deep otm options, is useless, as their price – hence the atnow curve – depends on another factor: the vega. So, as the delta of a future is fixed and underlying-dependent, but the delta of DOTM put is not dependent as well as their price, I implemented my method by not considering their delta, but their potential vega. This means that my atnow curve will vary on the basis of the implied volatility of those DOTM options strike, and not on the basis of the underlying index movements. When you look at an options strategy payoff, so, ask yourself a question: in case the underlying drops, will the atnow be what is see on my platform. No, never. The synthesis of the above is my method. My trading style is based on averaging down technique (by measuring implied volatility, skews and surfaces, open interest analyses and their delta, P/C ratios study, sentiment and so on) with extremely low cost futures, backed by deep out of the money puts (strike -40% of market price), with 6 mths expiration date, in a so huge quantity to be prepared and hunt for the black swan. Gamma and vega positive and delightfully concave.